RACINE, Ohio — The Lady Rebels played their best with their backs against the wall, but the Lady Tornadoes withstood the storm. The Southern volleyball team volleyball team won the first two games of Thursday’s Tri-Valley Conference Hocking Division match in Meigs County, but visiting South Gallia won the third game, forcing a fourth. The Lady Tornadoes edged their guests by just six points in the fourth, capping off the 3-1 win. The Lady Rebels (0-3, 0-1 TVC Hocking) scored the opening point of the night, but Southern (2-2, 1-0) claimed the next five points and led for the remainder of the first game. 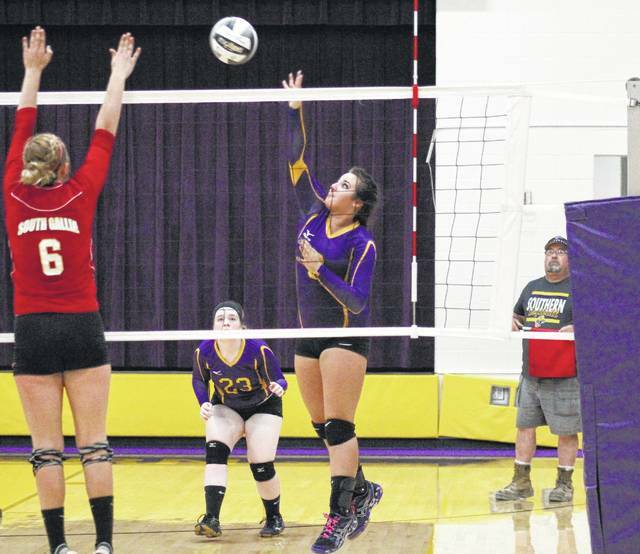 The Lady Tornadoes won the opener 25-16, with their largest lead being the nine-point final margin. The hosts never trailed in the second game, jumping out to a 12-1 lead. Southern’s advantage was trimmed as low as six, at 19-13, but the Purple and Gold extended their advantage back to double digits, taking the 25-15 win to move ahead 2-0 in the match. In a lose and go home situation, the Lady Rebels never trailed in the third game, leading by as much as eight, at 17-9. With an 8-0 run, the Lady Tornadoes tied the game at 17, but the guests claimed eight of the next 10 points. South Gallia won the third game 25-19, moving the match tally to 2-1 in favor of the hosts. The Lady Tornadoes led wire-to-wire in the fourth game, leading by as much as seven en route to the match-sealing 25-19 win. 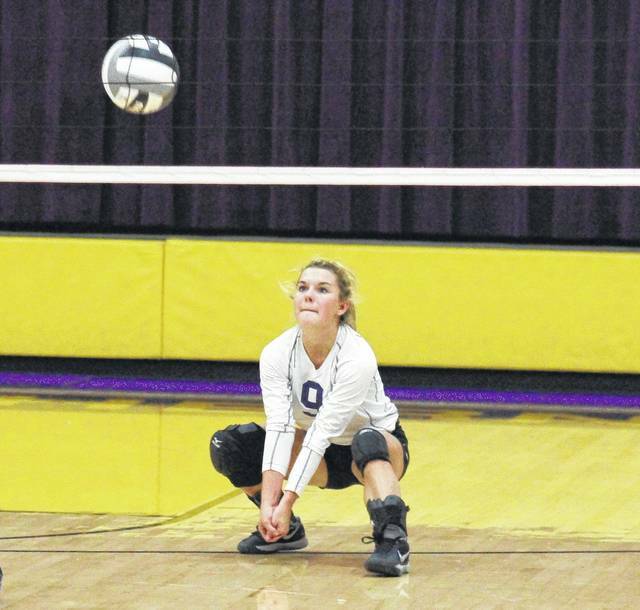 SHS junior Marissa Brooker led the Purple and Gold with 23 service points, including two aces. Next was libero Jane Roush with 14 points and pair of aces, followed by Jaiden Roberts with 13 points and two aces. Baylee Grueser had six points and one ace in the win, while Phoenix Cleland and Sydney Cleland both marked one service point. Rachal Colburn led the guests with nine points, including six aces. Amaya Howell had eight points and one ace, Erin Evans added seven points, while Aaliyah Howell, Christine Griffith and Keirsten Howell each had five points, with two aces by Keirsten Howell and one ace by Griffith. Kara McCormick rounded out the SGHS service attack with one point in the setback. Southern’s net play was led by Baylee Wolfe with match-highs of 11 kills and four blocks. 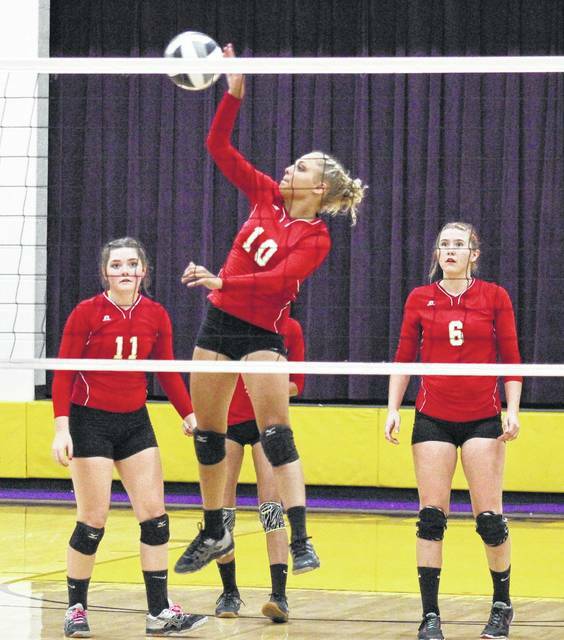 Roush had four kills for the Lady Tornadoes, Jolisha Ervin added three kills and one block, while Roberts and Sydney Cleland both marked two kills. Phoenix Cleland finished with one kill and three blocks, Paige VanMeter chipped in with one kill and one block, Shelbi Dailey contributed one kill, while Kassie Barton posted a pair of blocks. Roush led the SHS defense with seven digs in the win. Colburn led the charge for South Gallia, posting team-highs of six kills and three blocks. Erin Evans had four kills for the Red and Gold, Griffith added one kill and two blocks, while McCormick and Aaliyah Howell both had one kill. 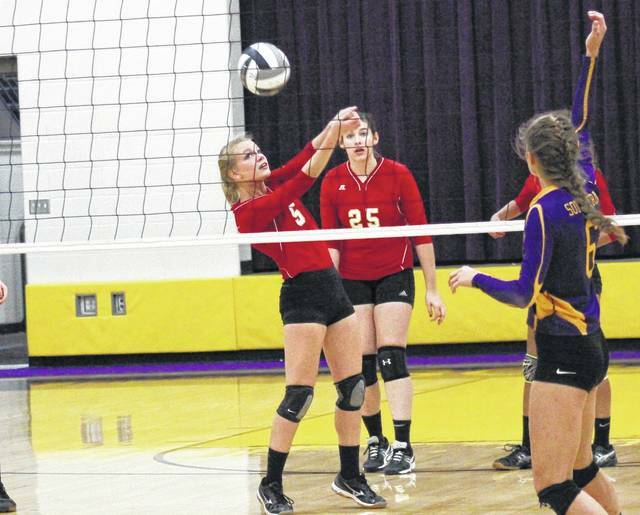 McCormick, Hannah Shafer and Olivia Hornsby each had one dig for SGHS. These teams will rematch on September 25, in Mercerville. Both teams are back in action on Tuesday, with Southern at Belpre, and the Lady Rebels at home, against Waterford. Southern’s Jolisha Ervin, in front of teammate Baylee Grueser (23), spikes the ball over South Gallia’s Rachal Colburn (6) during the Lady Tornadoes’ 3-1 victory, on Thursday in Racine.